Due to the July 12, 2017 Flood this trip had to be cancelled. We may reschedule some time, hope so. I'm not ready, and likely will never be ready for a thru-hike of the Ice Age Trail! But it does look like it provides some good backpacking opportunities and so that is what this page is about. We'll see what happens! 2017-06-26 Just finished reading the book, Thousand-Miler: Adventures Hiking the Ice Age Trail. I've not read any other through-hike books of the Ice Age Trail so can't compare it but I enjoyed it and felt like I got a much better "view" of the trail. I've read several books about through-hikes of the Appalachian trail and one about the Continental Divide Trail and this book seems up to or perhaps even better than those. I recommend it. Made me wish I had been into this at a younger age! For now I'll settle for a few shorter backpacking trips now and then. 2017-06-24 As of last night this trip has moved from a possibility to a probability as my friend and I met to talk it over. The upshot is that we pretty much agreed to do a two-night trip August 11-13. We will arrive at the trail head mid day on Friday the 11th and hike 4-5 miles to a camping spot. We’ll then hike about 10 miles all day Saturday the 12th and overnight again. Then we’ll finish up the 5 miles or so Sunday to our car. Our plan will be to drive our car to the east end (the end of the trip) of the Harrison Hills Segment near Parrish, WI and have a volunteer shuttle us to the west end (start of the trip) of the Underdown Segment at Horn Lake near Irma, WI 54442. One can “primitive camp” almost anywhere along the entire length of both major segments in the county forests. There are a few established camping areas and one recently built shelter as well as a formal camping area at the Underdown State Recreation Area. I’ve been told by the volunteer coordinator who is head of the chapter that maintains both segments that water is not a problem as there are many streams and lakes along the route and that filtering is all that is required. He also assured me that trees abound for hammock camping. The Harrison Hills Segment also includes the 2nd highest point in Wisconsin at just over 1900 feet, Lookout Mountain. I picture both segments as kind of like the Porcupine Mountains with a lot of smaller ups and downs over small hills with the Lookout Mountain being the only “sustained” climb. It is also described as one of the most scenic and beautiful areas of the entire 1100 mile trail. Of course all of my visualizations may be totally false! I’ve learned that you can look at videos and read lots of stuff but you really can’t adequately anticipate what a place looks like until you see it! So, this has gone from being an idea to being likely! Here is a link to Google Maps approximation of the trail. It is overall correct but the detailed hike route is not quite like the actual. Click HERE to see the Google Maps version. ​So real planning begins now! 2017-06-19 Driving home from buying a few groceries today I heard the tail end of an interview on public radio with a lady who through hiked The Ice Age Trail and wrote a book about it, entitled, Thousand-Miler: Adventures Hiking the Ice Age Trail by Melanie Radzicki McManus. So I bought the Kindle version and started reading it. Very interesting and informative as it gives quite a bit of background to the trail's beginnings along with her experience in doing the hike. I've enjoyed similar books about the Appalachian Trail and the Continental Divide trail so I'm glad to find one on the Ice Age Trail. It was also a beautiful day with highs to be in the upper 70s and some thunder storm activity forecast for the afternoon. I've not tried my hammock setup in the rain so I decided to set it up and give it a try. It is at least possible that if this short Ice Age Trail segment backpacking trip happens we could have some rain. So I set up my ENO Doublenest Hammock, ENO Guardian bug net, ENO ProFly tarp and DIY Under quilt and DIY top quilt. I used one inch straps and whoopie slings for hammock suspension instead of the ENO carabiners and Atlas Straps. Except for adding the bug net the setup was similar to what I used on the Porkies backpacking trip a couple months ago. 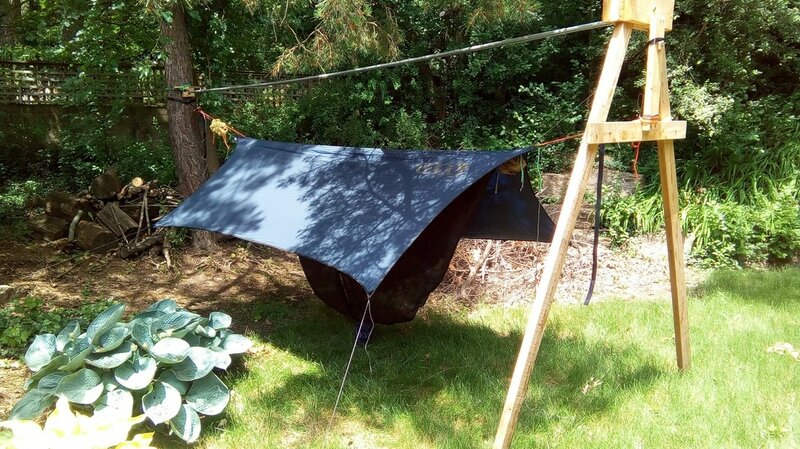 My ENO doublenest with ENO Guardian bug net, ENO ProFly tarp and DIY Underquilt and top quilt. started raining. That went on for about ​an hour. Most of the rain was light but there were a couple pretty heavy downpours that lasted ten minutes or so. And there were a few gusts of wind but nothing serious or sustained. I did pull the light top quilt on but it was a very pleasant experience. The sound of the rain on the tarp with thunder in the background made for good "music" and it was hard to NOT fall asleep. On the Porkies trip as well as the one nighter with some guys from church the only "complaint" I had with the hammock is that after lying there a while my legs felt a little strained or restless. I normally sleep on my side so being mostly on my back was part of it I'm sure. But I watched a YouTube video by Outdoor Vitals entitled How to Sleep Comfortably In a Single Person Hammock. His focus was how to solve the leg problem if you have to sleep banana style but his pointer fits other situations as well. Basically he suggested putting a pillow under your knees. I've seen and read that suggestion from others too. But I tried it this afternoon. It made a positive difference. Of course I wasn't in the hammock all night but it sure seems like it is a good idea. The DIY Under quilt and DIY top quilt were both perfect. The temperature dropped to 59 during the storm and I was all comfy and warm. And I was just wearing cotton shorts and a cotton short sleeved golf shirt as well as cotton socks. If I were on the trail I would wear at least a merino wool blend long sleeved shirt, merino wool blend long johns and wool socks. I think this setup would be good down to the low 50s anyway and probably lower with an added layer of clothes. I'm happy about that as the two together only weigh two and a half pounds. Here is what I think I've learned. The overall plan to do the Underdown, Alt Junction and Harrison Hills segments with two or three overnights is feasible. The trail is hilly but not excessively so. It is a beautiful section of the trail. Water should not be a problem and should only need filtering. Primitive camping is allowed on the entire trail with the exception of a very short segment that is on State Fisheries property. There is a new shelter at Dog Lake (around mile 337) on the Underdown segment. There are several people who can probably help with a shuttle. It will be best to leave our car at the end of the hike and have the shuttle take us to the starting point rather than the other way around. Using a hammock should not be a problem as trees are plentiful. 2017-06-13 I and a friend are considering a backpacking trip later this summer so I am researching possibilities. The Lincoln-Langlade counties segments of the Ice Age Trail look like a possibility. It starts at the Horn Lake Campe site north of Merril, Wisconsin and taking the Underdown Segment (Map 29f), the Alta Junction Segment (Map 30f) and the Harrison Hills Segment ends up 22.5 miles later at Lincoln-Langlade county line at the intersection of First Lake and Parish Lake Roads. If one took two cars, then both cars would drive from Burlington to the trail ending point on 1st Lake Road. Leaving one car there at the parking lot the other car would continue south west to the starting point at Horn Lake Campground. The map below shows the hiking route based on the Ice Age Trail Atlas. Day 1, Camp 1: The drive from Burlington is about 3-1/2 hours plus a 45 minute drive to the Horn Lake starting point so should be on the trail around noon. The Underdown Segment of the trail starts at mile 335 near Horn Lake. The first overnight might be near the end of the Underdown Segment at the Underdown Recreation Area which is about a mile north of mile 339, the junction with Loop Rd. That would make for a roughly five mile first half day. Day 2, Camp 2: Day 2 hike would complete the Underdown Segment and the short Alta Junction Segment and continue on the Harrison Hills Segment for about ten miles. There are no established camp sites along the route so the second night camp would have to be a primitive camping somewhere between the ghost town of Dunfield, mile 345 and Bus lake which is at Mile 350. Day 3, Camp 3: The third and final camp night would be at around mile 356 at LI37 or Li38 on chain Lake, making for a 6 to 11 mile day depending on where we camped the night before. Day 4, Last Day: The last day would be a short hike of just a couple of miles to the parking lot at First Lake Rd. which is at mile 358. From there would be the 45 minute drive back to Horn Lake to the second car and then 3-1/2 hours back home.